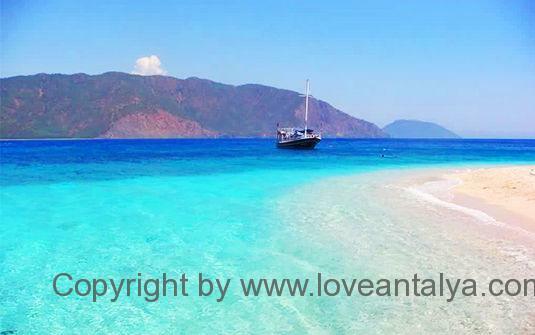 Today we’re going on vacation in Antalya (among other places) and we are really, really looking forward to it. So we have beed in “planning mode” for some time now and have thought and consideration, twisted and turned, what and where we are going. And it is not quite so easy! One would have thought, that we were well fed and have seen, what there is to see, after having lived and traveled in Antalya for many, many years. But no – we are always busy and the time is never enough. But this year it will be different – this year there should also be room for new adventures. 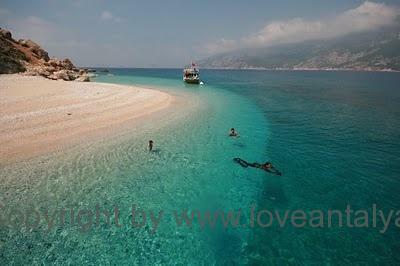 One of my biggest dreams (which might not come true this time) is to rent a boat and then sail around the peninsula at Tekirova / Cirali / Adrasan. It is strange enough an area I’ve never been to. It is also here, that many pictures from the glittering tourist brochures are taken, because the water is excruciatingly clear and the colors irresistible and surreal. So one must say, that it is really promising. My husband can tell the wildest stories about fishing in stormy weather and near-death experiences on the water in these parts, but it is somehow a bit unreal, when one has studied the pretty pictures. So a boattrip must be able to do it (and no, not to hunt near-death experiences, but rather of chasing beautiful pictures and good experiences). What a day it could be with visits on the many beautiful islands, that dot the bay, swimming in the Mediterranean Sea directly from the boat and discovering the wonderful and wild nature. And it is actually possible to rent boats there (although it is quite expensive). You can for example check airbnb – they apparently also do it in boats (yes, it didn’t knew that – just thought it was houses and apartments) and getmyboat.com can help you with everything from a surfboard (yeps – it is true, that it is being rented out !!) for inflatables (!!!) for kayaks and larger or smaller motorboats and even entire Gullet (those tourist ships – or yalla boats as we call them – sailing off with full music). The possibilities are endless, and you can both travel all by yourself or with others (I will clear any time just chose my family). But the possibilities are many and it is something that CLEARLY must be explored at a time …. What to do in Adrasan? 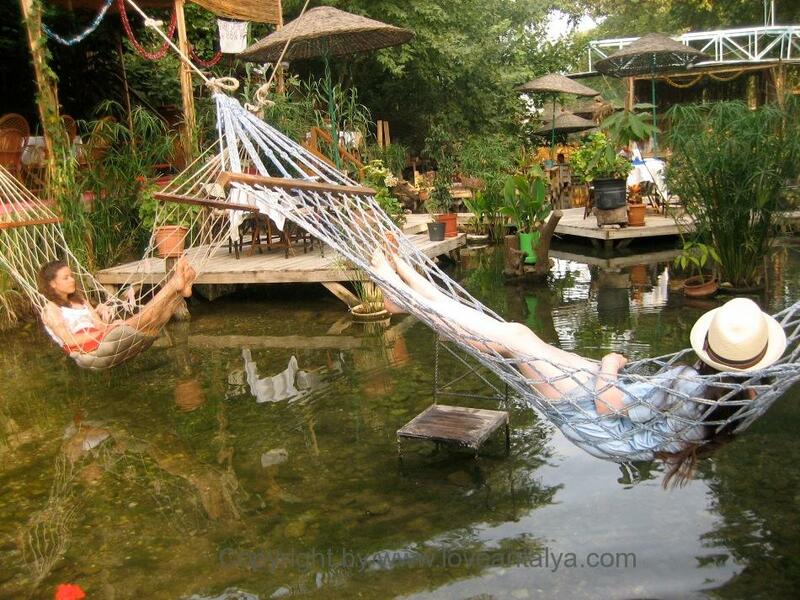 Adrasan (Cavuskoy as the city is also called) is not an actual tourist town, although there are some hotels. There is a long way to everything, and it is an advantage to have a car, if you want to stay here. If you are lucky (and persistent in searching for it) one can find diving and yoga trips, as the area is designated as a little alternative and without great luxury and comfort. So one should not come here and expect the resort-vacation at all-inclusive hotels, for it simply does not exist. One must come to explore the wild nature and bathe in the beautiful, clear blue sea. 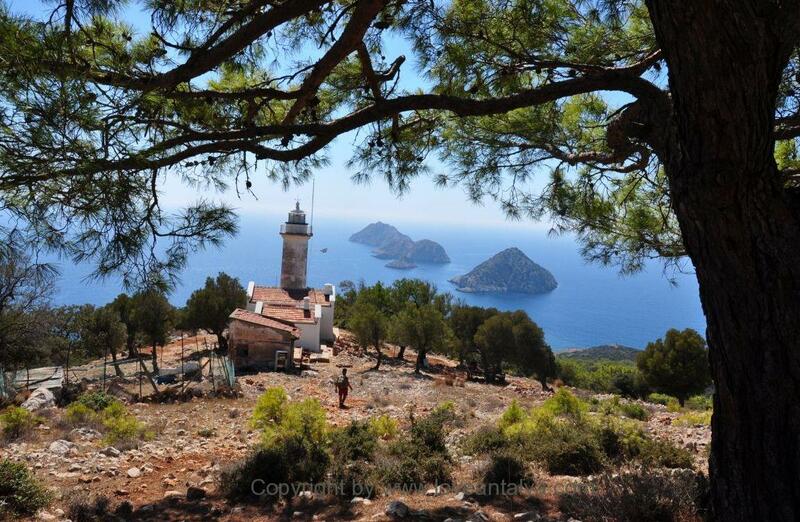 There are also several hiking trails in the area and an apparently a very famous route called The Lycian Way. I am not into trekking (although I really do see the charm in it), but this route should belong to one of the world’s best top 10, so perhaps it is the place to start 😉 There are supposedly as many as 200 km of trails to choose from, so a card can be recommended … these seems quite reliable and doing nothing but arranging trekking trips to Turkey. 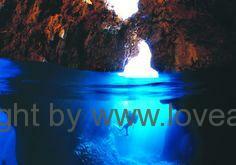 If you’re into diving, this area shoul be completely sovereign (which include several caves to dive in). However, there are some places, where you should not dive, because the sites are still being archaeological investigated (and the penalty is HARD if you still sneaks there – several thousand in fines and several years in prison). I have not studied so much about dives yet, but I’ll write more about it at another time. Although we already have a very tight schedule, we could well consider to stay in Adrasan – especially after seeing some of these homes at airbnb! There are truly something for everyone. We’ve never been on a campout with the kids, but check this “tent” – I could seriously consider it (I’m sorry, but I can not be allowed to download and show you the picture of it). Of course you can also stay at the hotel and here is actually some very good offers. Check ex. 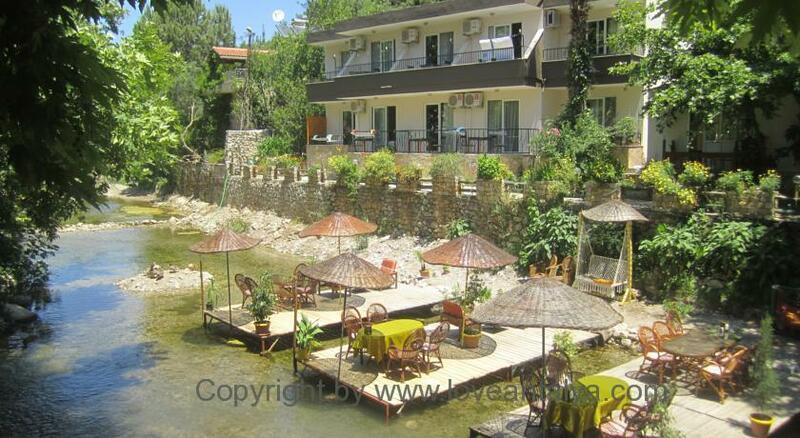 Arikanda River Garden Hotel or Ford Hotel or the Paradise Hotel for a little more low-key atmosphere. Or how about your very own house, as seen here ?? A few of the places, that we really hope to see, is especially the beautiful lighthouse Gelidonya that towers over Cavus bay. The view we simply HAVE to experience. And so is a visit to one of the cozy tea-houses also quite high on the list. There are several to choose from – all located in the partially dried out river bed, but Arikanda – thehouse should be one of the better and I’ve got it recommended from several locals too. A trip to Adrasan takes about 3 hours from Antalya, so the trip could easily be combined with an overnight stay and a walk on the burning Olympos Mountain (which you can read a bit about here) and perhaps a whole day at the beautiful Phaselis Bay, I still always suggests. Yes, the dreams are many – and fortunately for that …..